Home » Animals » (UPDATE) Whatever Happened to ‘Embassy Cat’? (UPDATE) Whatever Happened to ‘Embassy Cat’? In a video posted today by WikiLeaks, Embassy Cat can be seen purr-ched in front of a TV screen showing footage of Assange being carried out of the Ecuadorean Embassy in London. Embassy Cat, however, seems more interested in perhaps catching a fly than watching his former friend’s ordeal. There are many unanswered questions as to what will happen to Julian Assange, the man who spent seven years holed up in an austere corner room at the Ecuadorean Embassy in a plush London neighborhood. However, for cat lovers around the world, the more urgent question is what happened or what will happen to Assange’s cat, the so-called “Embassy Cat,” also known as “James” or “Cat-stro,” the latter name after Cuba’s Fidel Castro. Would Cat-stro be extradited, too? What secrets did it know? Had it been involved in “counter-purrveillance”? Would it be called to testify? Would it be interrogated, perhaps even tortured? What would happen to its Twitter and Instagram accounts? 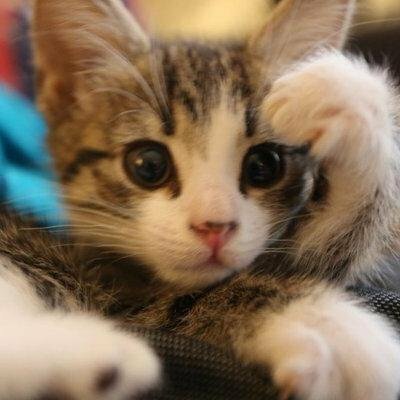 You see, James or Cat-stro had not only been a trusted companion to Assange, a source of entertainment at the embassy (It had a penchant for ambushing the embassy’s Christmas tree ornaments), and had helped defuse tensions inside the embassy, but it also had a significant internet following of its own, reportedly with 31,000 followers on its Twitter account and 5,000 on its Instagram account. If various media reports are correct, Embassy Cat’s fans need not worry. Other reports confirm that Embassy Cat was whisked away several months ago and given to a family member in Australia when Ecuador threatened to put the cat in a shelter. Already souring on Assange because of his continuing attacks on Ecuador and on its president, the Ecuadorean Embassy also became dissatisfied with Assange’s hygiene and had instructed Assange to clean his bathroom better and to take better care of Embassy Cat, warning Assange to look after Cat-stro’s “well-being, food and hygiene” or risk his feline companion being confiscated, according to the BBC. Wherever Embassy Cat may be, it may be happier in its new home, according to John Bradshaw, a scholar and expert on cats, dogs and their relationships with humans, if reports of the cat being mistreated are true. 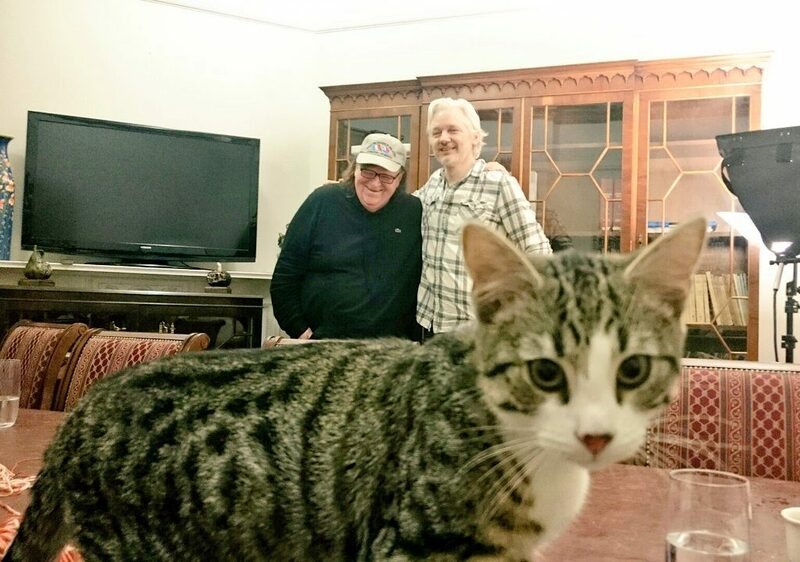 Looking at the photo below, having a tremendous love for cats and giving Assange the benefit of the doubt, I would hope that Assange misses Embassy Cat even if just a little bit. 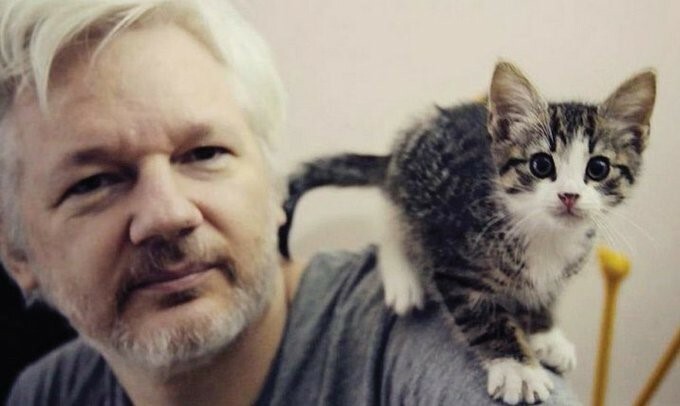 I am sure that, in his British jail cell, Assange would love to have Embassy Cat’s companionship back again. All images from Embassy Cat’s Twitter and Instagram accounts.